I just received my order and it is so beautiful. The little details on the leaves just adds to the beauty. I am so happy with this purchase. Gussy up the plain wall behind your sofa with this exquisite handmade piece of art by Stratton Home. 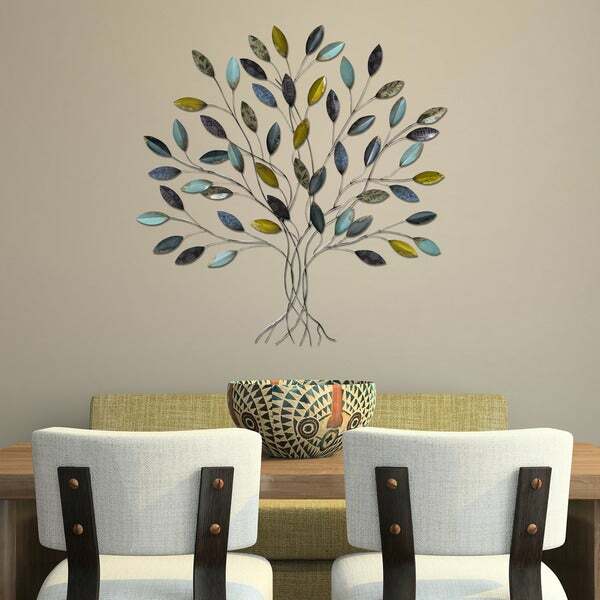 The multicolored leaves add a touch of style and pique interest in your living space. 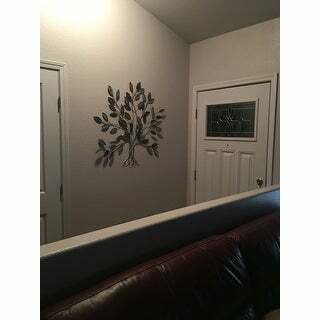 We are very happy with our purchase of the Stratton Home Decor Tree Art. The size and color is perfect for above our new fireplace, and will just need a few pieces on the mantle to accompany it. Shipping was fast, and the item was very well packaged. It was a cinch to hang. This piece is breathtaking. I was hesitate about buying this. The photo does not do it justice. When the light hits it, it glows. Don't hesitate. Grab it up. I bought this to fill a cove in my wall. It fit so perfectly, and the colors and the art is beautiful. I am so happy with this purchase and it is so light to hang. The perfect size and colors for our living room. Really like it! The light bounces over the leaves, the leaves and branches are not flat against the walls and that makes the shadows add extra interest. Have placed it above a table lamp, creating more shadow play! Would recommend. 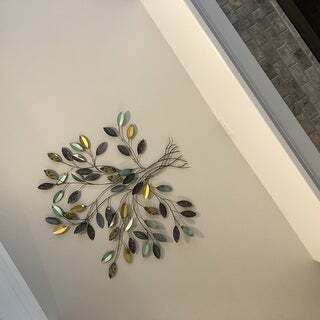 Love this wall decor! Can't believe how beautiful it is on the wall! It arrived as scheduled and I hung it above the bed in the guest bedroom. It is stunning and I love it. I keep opening the door and peeking in just to look at it. Yes, it's a keeper and I do recommend it. This piece is beautiful. I had a round mirror in my bedroom which was glued to the wall..it was 36inches round..and sooo very out of place. i hung this on top of it and everyone is astounded by how beautiful it looks. It is a beautiful conversation piece the room. Beautiful. It catches the light just right. Recommend highly. I really like this wall hanging. This wall décor was very nice, but not big enough for the wall I wanted to hang it on. Really a nice piece and sturdy. I thought it might be flimsy, but it was not. Colors are vibrant and I have received several compliments. Place on a sturdy wall. Colors were exactly as shown. 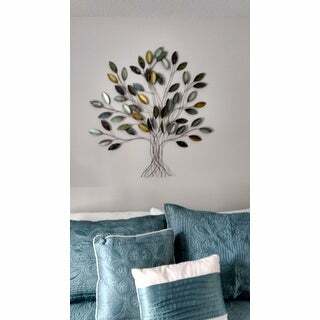 Easy to put on wall an looks beautiful! This item weighs 1.10 pounds. The shipping weight is approximately 2 lbs. "Do u sale the bowl that's on the table?" Unfortunately, the bowl pictured was a prop only and is not available for purchase. "What color are the tree trunk and branch wires?" Almost looks like a polished nickel. Colors are gorgeous together. Well balanced with blue and green and neutral brown hues on leaves. The print on the leaves really add character to the piece. "What is the size? Can it be used outside? 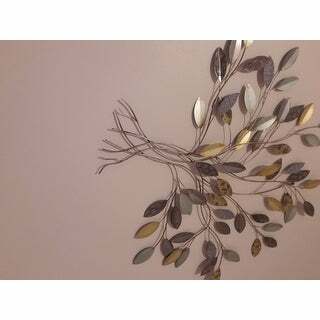 Thanks:)"
The wall decor is 33 inches high x 36 inches wide x 1.75 inches deep. It is recommended for indoor use. I love trees, their color & dimensions. This color should work beautifully in my living room. "If there are no hooks on the back how do you suggest hanging this piece on the wall?" I disagree with the previous comment. There is a hook on the back. All you need is a nail. Since the piece is so lightweight, I used a finishing nail.